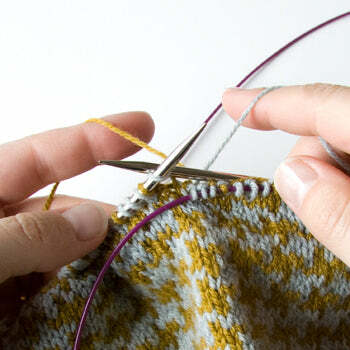 In stranded color knitting (often called Fair Isle knitting), two or more colors are used on each row. If you're new to stranded color knitting, I recommend not worrying about yarn dominance for a while. It's an important concept that will help your color knitting look even more perfect, but not 100% necessary at first. Let's say you're using two colors (which is typical for most stranded color knitting). When you switch from one color to the other, you either bring the new color over or under the old color. This over or under is where yarn dominance comes in. Yarn that goes over is (very slightly) closer to the needle, and so doesn't have to travel as far. Yarn that goes under has to travel a tiny bit farther. The farther the yarn has to travel, the more slack that will be created in the strands (or floats) on the wrong side of the knitting. Yarn brought under dominates. This is because yarn brought over will make tighter stitches, meaning they appear smaller. Yarn brought under will make looser stitches, meaning they appear larger. A bit of an oxymoron if you ask me, but there you have it. Again, that question is complicated by the color combination, the pattern repeat size, and the design. The short answer is: make the foreground dominant, but more importantly, be consistent. You might say that the foreground color should always dominate, meaning the background color should travel over. But that's not an easy thing to decide, since the background and foreground aren't always clearly defined in color knitting. This chevron hat (image, bottom) is a perfect example. Each horizontal zig zag is its own motif; which one is the background to the other? You might say that the red is the background, but because it's the warmest and brightest, it tends to dominate the hat. (That's what makes chevron such an intriguing motif; it both pushes and pulls the eye, and that engages the brain.) 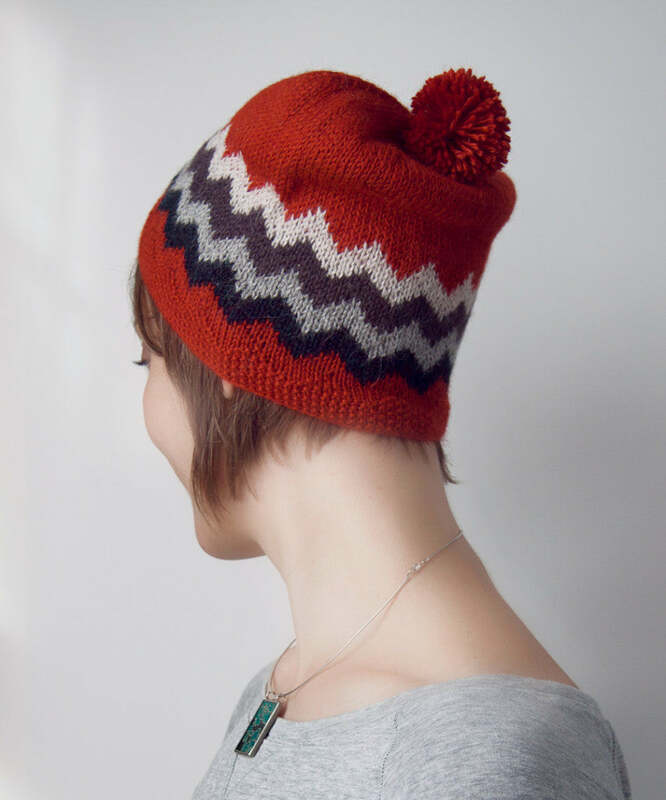 This chevron hat by the way, will be released very soon, and is called Epinette! If you are interested in perfecting your color knitting, I highly recommend Mary Jane Mucklestone's 200 Fair Isle Motifs: A Knitter's Directory . It has a concise but thorough tutorial on stranded color knitting, followed by 200 motifs, organized by size of pattern repeat.